2. Chop the marshmallows and set aside in a bowl. Chop the chocolate and set aside. If your chocolate is at room temperature (which in the summer time may be pretty warm), place your chunked chocolate in the freezer while you’re preparing the dough. I did this step because my chocolate bars were pretty soft when I chopped them. 3. In a mixer or a mixing bowl, combine the butter and sugar and mix until smooth. Add the honey and mix, followed by the eggs, vanilla extract and lemon juice. In a separate bowl, combine the wheat flour, all-purpose flour, baking soda, cinnamon, salt and oats. Stir the ingredients to combine. Add the dry ingredients into the wet ingredients in small portions, mixing continually. Add the chopped walnuts and chopped chocolate bars. Stir to incorporate into the dough. 4. Take a few pieces of marshmallow (I did 3 per cookie) and some dough and form balls, making sure the marshmallows are engulfed in dough. Evenly space your cookie dough balls on a baking sheet and bake for 10 to 12 minutes. I took all of my batches out at exactly 10 minutes and liked the way they turned out. 5. Alternatively, you can try mixing the marshmallows in the dough when you mix in the nuts and chocolate. I haven’t tried this, so let me know the result if you do. 6. *Note: I bake at elevation, my baking instructions may be slightly different from low-elevation baking. 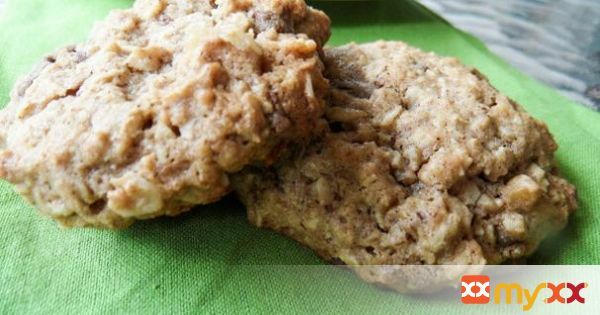 Consider reducing the all-purpose flour a little and if you typically bake at 350, do the same for these cookies.